Do you know Irena Macri? She’s pretty fabulous! She’s the brains (and beauty) behind the web site Eat Drink Paleo, and she’s the author of the Eat Drink Paleo Cookbook, Happy Go Paleo, and the colorful, delicious ebook Salad A Day. I’m a huge fan of Irena’s delicious recipes, gorgeous cookbooks, sassy personal style, and luscious photography. I’m also super into salads—we eat salad almost every day for lunch here in Prague. 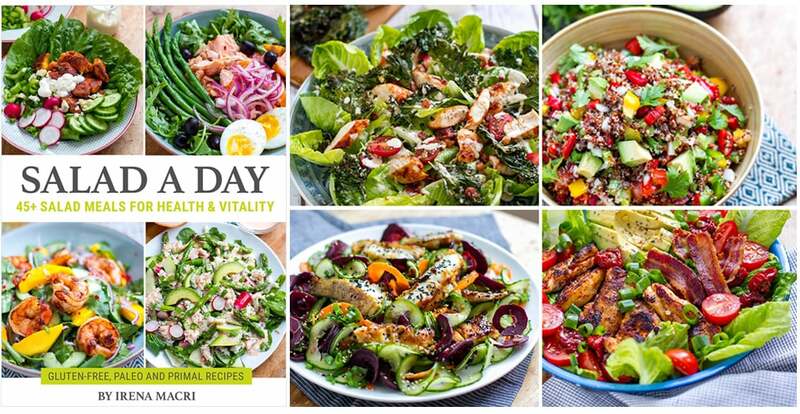 Salad A Day is packed with 47 salad recipes, plus dressings and tips, so you can literally eat a different salad every day for at least a month. Irena’s so cool, she said I could share a recipe from Salad A Day, and I chose Ukrainian Vinegret with Beetroot and Potatoes because it’s pink (! ), loaded with resistant starch, easy to make, and tastes better the longer it sits. Enjoy! From Irena: This is a salad of my childhood. 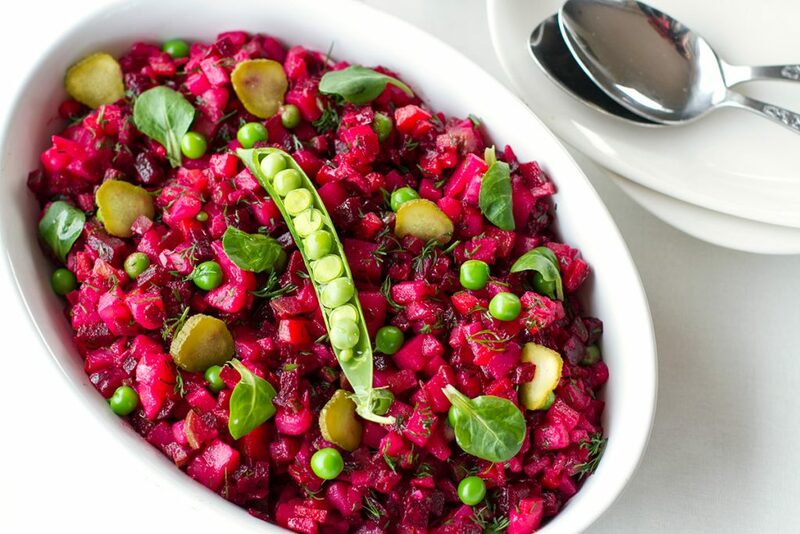 My mother often made this cold beetroot and potato salad, especially in summer. This salad is a great source of resistance starch from cooked and cooled root vegetables, and is high in vitamins. It keeps well too. Bring a large saucepan of water to boil and cook the beets, potatoes, and carrot for 20 minutes. Remove the carrot at the 20-minute mark as it takes less time to cook. Rinse the root vegetables under cold water and leave to cool for at least an hour (this can be done ahead of time). Combine the diced pickles, dill, and onion in a large salad bowl with the dressing ingredients and set aside. Bring a small saucepan of water to boil and cook the peas for 30 seconds to a minute. Drain and rinse under cold water to stop the cooking process. Once cooled down, peel the potatoes, beets, and carrot, then cut into 1/2-inch dice. Combine with the rest of ingredients and the dressing in the bowl. Note: Cold potato salad is one of the healthiest ways to enjoy white potatoes. Once the potato is cooled, its content of resistance starch increases making it even more beneficial for our gut health. Ooh, I definitely have to try this salad! I am currently obsessed with beetroots because a farmer down the road from me sells big bunches them, fresh dug, at his gate for £1! He sells potatoes too so this is perfect! Thanks for sharing. Melissa, I’m a huge fan of you! Thank you for being SO incredibly generous and user-friendly. YOU ROCK! Well, aren’t you nice?! Thank you so much.